From a collection of minerals once owned by Thomas Edison to a 4.5 billion-year-old meteorite you can hold in the palm of your hand, eons of geological history will be on display at Wayne State University's new Geology Mineral Museum — the first of its kind in Detroit. The museum, located on the lower level of Old Main, will showcase some of the rarest items in Wayne State's collection of thousands of geological specimens. Also on display is a unique slice of plumbing unearthed from Edsel Ford's historic Highland, Michigan, estate. Construction workers salvaged the pipe when they discovered several sparkling layers of crystallized calcite inside. In addition, visitors will see a collection of nearly 50 agates from across the globe, as well as a display of antique miners' lamps dating as far back as the 1800s. A display of fluorescent and phosphorescent rocks illuminated by ultraviolet rays is also planned. An academic services officer in the Department of Geology, Lowrie has worked at WSU for more than 50 years and knows the backstory on each piece in WSU's dynamic collection many of which he has personally acquired. Asking Lowrie to identify his favorite specimen in the museum is like asking a mother to choose her favorite child. Among several pieces from long-shuttered mines from across the world, he points to a brilliantly scarlet-hued quartz on hematite as one item he's particularly proud of. 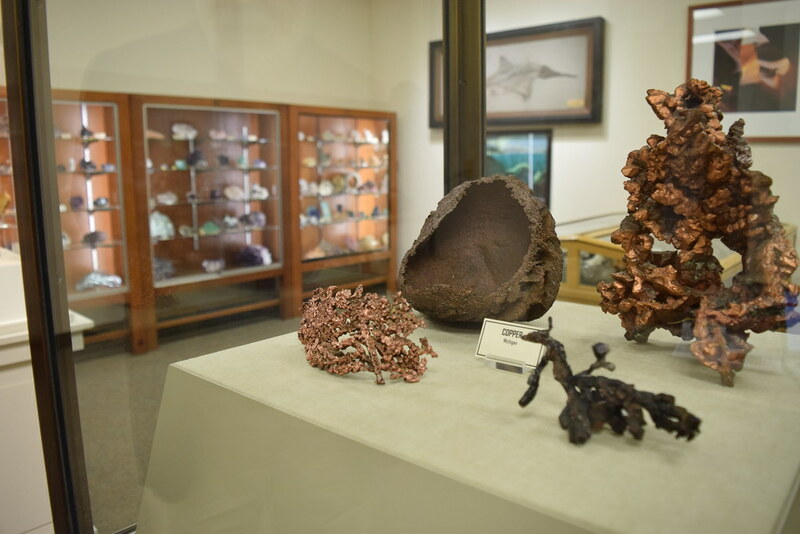 The Wayne State Geology Mineral Museum is open to the public from 2:30 - 5:30 p.m. on Tuesdays and from 5 - 8:30 p.m. every Friday during the winter 2019 semester.